Palace Guard's Grenadier has an impressive genetic background. His sire is Sire Is MFI Peruvian Palace Guard, who has Peruvian Bueno and Timoteo in his background. His Dam is FFTX Peruvian Vanity Fair, whose grandsires are Peruvian Chinchero and King Solomon. Click on the ARI Reg Papers icon to the left. Grenadier has done well in the show ring. Click on the Awards button above. Grenadier's owner is eager to sell him so is offering him at this special pet male price. Grenadier will be transferred as a non-breeder. Grenadier is a very mild manner boy who is easy to handle. 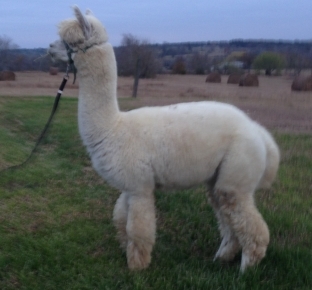 He will make a good PR animal in addition to a nice fiber animal. We are brokering this boy for our boarders, David and Sandy Kimbrell.